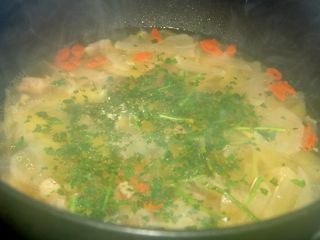 As I said yesterday, if you don’t want to make dumplings for winter solstice day, let’s make a healthy lamb soup. 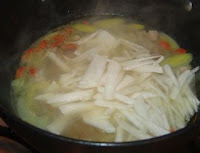 :)) It is another most popular dish for entering winter. According to the news, these days, because of the winter solstice day in China, lamb has become a most popular food and the price of lamb has rapidly increased. — So, it seems many people are celebrating with lamb this year. This lamb and radish soup is popular not only because of its taste, it is also famous for its health benefits. 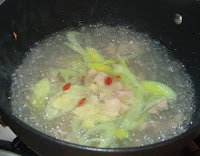 Probably you are familiar with the reputation of ‘healthy soups’ in China, most of them are from Cantonese cuisine with many herbs, but the recipes of ‘healthy soup’ in Northern China are a totally different story. This is probably why you rarely come across this kind of dish in any Chinese restaurants outside China, as most of them serve Cantonese or southern Chinese cuisine. Ok, talking about the nutrients in this dish — lamb alone in Chinese medicine is considered as ‘warm’ type of food, which is good for smoothing the ‘qi’ in the body, helping the weak part of the body strong. It is said that lamb is a perfect choice for people who feel particularly uncomfortable in cold winters. The combination of lamb and radish is a very good tonic for the body without causing ‘body heat’, or feeling ‘too full’, so it is good for everyone. This combination is particular good for people have anemia, or normally have ‘cold’ hands and feet. I have to admit that I have never been a big fan of cooked radish, but in this recipe, if you are like me, just having the soup is already enough without having to swallow the radish — but of course, radish has to be fully cooked in the soup. There are many many ways of making this lamb and radish soup, for example, how to chop the lamb and radish, and what particular seasonings are used. This is a very easy homemade healthy recipe, you can alter it a bit to adapt your own purpose or taste. 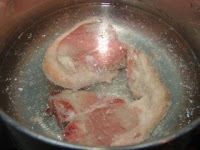 1) Soak the lamb in cold water for half an hour, and ‘dip’ in boiling water briefly. 2) Chop the lamb into small cubes. 3) Chop radish into strips. 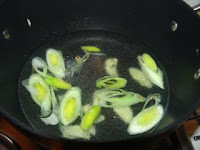 4) Chop a small size of ginger and 1 spring onion into strips. 1) Pour in around 3 tablespoons of oil in a heated wok. 2) Then add in chopped spring onion and ginger. 4) When the water is boiling, add in prepared lamb cubes, and a small handful goji berries. Cover the lid, turn down the fire to low, let it boil for around 25 minutes. 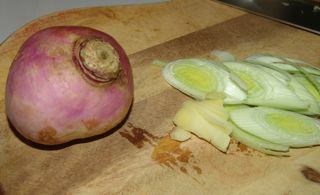 5) Then add in chopped radish, keep on boiling for further at least 25 minutes or more. 6) Then add in around 2 teaspoons of salt (probably you will need a bit more), and 2/3 teaspoon of ground sichuan peppercorn, keep it boiling on for further 5 minutes. 7) Before serving, if you like, add in some chopped coriander leaves. — It is optional, but coriander leaves are very popular with lamb soup, it gives an additional fresh taste. For making it more healthy, it is also good to add a few dried jujube fruits. And if you like, fensi is also very good with this recipe. Personally, I like to have this lamb and radish soup with Chinese steamed bread, bao zi or flat bread with fillings, but plain rice is also good.